A couple of weeks ago I decided it was time to try another Cheddar. This time I opted for Ricki Carroll's Stirred-Curd Cheddar recipe. It is still a bit of a cheddar shortcut, but a little more involved than the Farmhouse Beach House Cheddar, since you do need to "cook" the curds for about an hour (stirring every few minutes to keep them from sticking together). However, I think it differs from a traditional cheddar in that you keep the curds separate while cooking (cheddaring?) 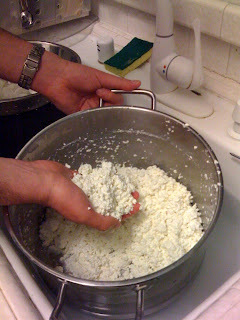 them, rather then draining them and them cutting the block of drained curds into strips. This cheese also needs to be waxed before aging. I used my smaller press hoop to create a taller cheese--then cut it in half before waxing. This way I ended up with two one-pound wheels. I plan on aging one for two months, and the other a bit longer to see how it develops.